Committee to Save Cooper Union co-founder Adrian Burton Jovanovich, center, an alumnus of the school, speaks about a lawsuit against the board of trustrees May 28, 2014. EAST VILLAGE — The fight to keep Cooper Union tuition-free continued this week as a group of professors, students and alumni sued the school over its plan to begin charging tuition this fall. Angry members of the Committee to Save Cooper Union, who filed the lawsuit Tuesday in New York State Supreme Court, gathered outside the school just after commencement Wednesday to slam the administration. Last spring the college said it could no longer afford to pay students’ tuition, as it had for more than a century, and would instead offer half scholarships to incoming students starting in the fall of 2014, making the cost to attend just less than $20,000. But at Wednesday's press conference, advocates claimed the board had made poor decisions that undermined the college's financial health, including constructing a new engineering building without adequate funding and hiring private security for the school's president. The committee also criticized the school's board for dismissing cost-cutting plans that would have bridged the school’s deficit while preserving free tuition. The lawsuit seeks an injunction to stop Cooper Union from charging tuition and also seeks a court order requiring the school to disclose its finances in more detail. In a statement before the press conference, Cooper Union spokesman Justin Harmon said the school was dismayed by the group’s decision to go to court. “We are disappointed that the Committee to Save Cooper Union would choose costly litigation over constructive conversation,” he said, according to reports. Cooper Union was founded in 1859 to give working-class students the higher education they would need to participate in shaping public life. Along with its rigorous programs in art, architecture and engineering, the school’s free tuition has long been a large part of its identity. 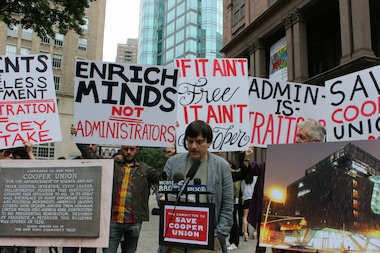 Members of the Committee to Save Cooper Union said the school's character would change if it started charging tuition. The free tuition was an equalizer in the classroom and brought students from different backgrounds together, said Michael Essl, an associate professor of art and a plaintiff in the lawsuit. “At Cooper Union we have something very special that the administration is trying to destroy,” Essl said. The lawsuit comes after more than a year of protests and other efforts to prevent the school from charging tuition.